Fingerling Potatoes are small and slender and somewhat resembling fingers (hence the name), fingerlings are a low starch potato that holds its shape well making them a good, albeit petite, all-purpose potato. Though they come in a variety of colors (tan and red as well as purple), all have a thin skin and a denser flesh than round potatoes. Fingerling varieties include Russian Banana, Butterfinger, and Rose Finn Apple (which has rose-pink skin and yellow flesh that’s blushed with red), Ruby Crescent, and Purple Peruvian. Most recipes calling for fingerlings have you leaving the tender skins on, a good thing since their tiny size makes them tedious to peel. Heat oven to 400 degrees. In a small bowl, combine salt, pepper, and rosemary. 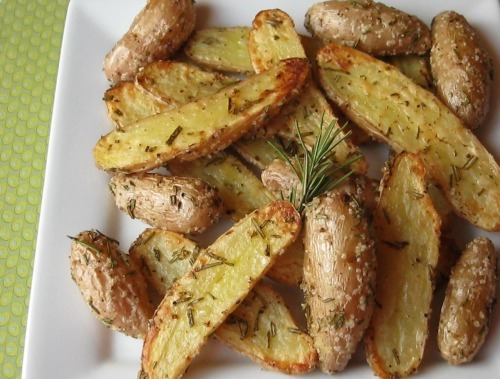 In a large bowl, toss potatoes with olive oil. Sprinkle with salt mixture and toss to combine. Transfer potatoes to a roasting pan. Roast until golden brown on the outside and tender when pierced with a fork, about 25-30 minutes, turning halfway through. Preheat oven to 425 degrees. In a roasting pan, stir together the first six ingredients. Clean potatoes. Add to roasting pan and stir to coat. Roast in oven turning every 15 minutes for 45 minutes total. Add herbs and serve. Bacon & Potatoes … need I say more? Preheat the oven to 400 degrees. Line a baking sheet with foil, and top it with a sprayed baking rack on top, and set aside. Whisk the Spicy Creamy Dipping Sauce ingredients in a small bowl, and set aside for flavors to meld. Place potatoes in a medium saucepan, cover with cold water, and bring to a boil. Season the water with sea salt. Once the water begins to boil, par-cook potatoes for about 5 minutes. Drain the potatoes, and place them in a large Ziploc bag. Add the rosemary, olive oil, and freshly ground pepper, and toss until the potatoes are evenly coated. Cut the strips of bacon in half lengthwise, and then in half crosswise. Wrap each piece of potato in a strip of the cut bacon, securing them on metal skewers (or toothpicks/wooden skewers that have been soaked for 30 minutes), leaving a bit of space in between pieces. 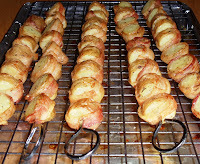 Place skewered potatoes on the prepared baking sheet/rack, and bake for 30 minutes, turning half way, until the bacon is cooked through and crisp. 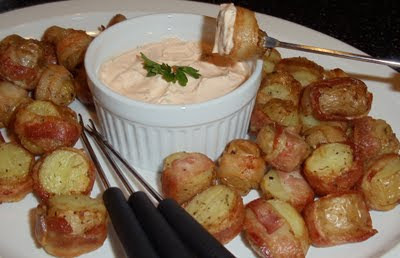 Place the potato bites on a serving platter, along with the dipping sauce. – Enjoy! Preheat the oven to 350°. Wash the potatoes and pat them dry. If fingerlings are not very small, cut them in half. Strip the stems off the rosemary and coarsely chop the needles. Heat the olive oil in an oven-proof skillet over medium-low heat. Add the potatoes, garlic, rosemary and a few grinds of pepper. Fry, stirring occasionally, until the potatoes start to get crisp. Stir in the vegetable of choice (you can use more than one) and cook for 2 or 3 minutes longer. Cover the skillet and place in the oven. Bake for 15 to 25 minutes, until the potatoes can be pierced with a fork.